We found that many people used the pro upgrader in the free version but then did not register for a free 30-day-trial license key. Anyway we understand that some people are more concerned than others about this issue and therefore we have added an new option which allows users to start an anonymous free 30-day-trial period in pro v1.1.1 (please note that since pro v1.1 you can also test Leaflet Maps Marker Pro without a license key and without time limitation on local host installations). Please note an anonymous free 30-day trial period can only be started once per domain. 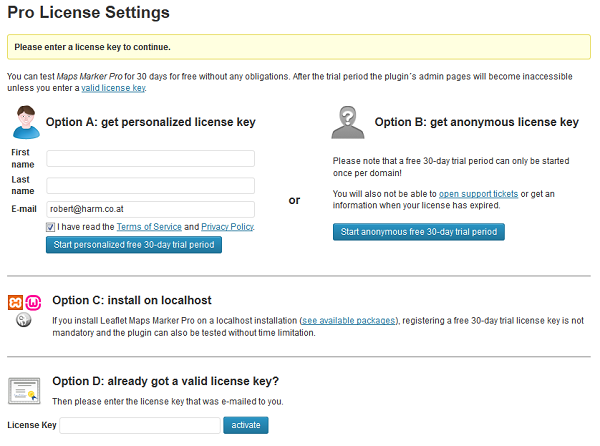 Registering a second free license key for the same domain will result in the automatic suspension of the new license key.